Black Stallion Cabernet Savingnon is an easy drinking cab from a small winery along the famed Silverado Trail in Napa Valley. A good buy at under $20 a bottle, a great buy if in the $10 range. I forgot what I paid, and when I see it again, I’ll try to put it here. Not a lot of Oak or gum drying tannins. Just a smooth drinking Cabernet Sauvignon that lets the fruit roll across your palette. Add a good steak, Rutherford Grill style Grilled Artichoke and you have a nice meal. 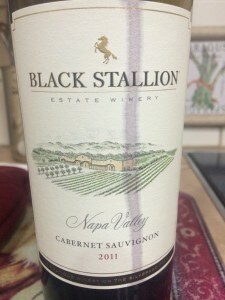 2011 Black Stallion Cabernet – We like It! Next Topic: Bluetooth Fix For iOS 8, 8.0.1 and 8.0.2 ?